All Aquatics programs are at the Oak Creek High School pool. Enter at door #21 on the east side of the building. 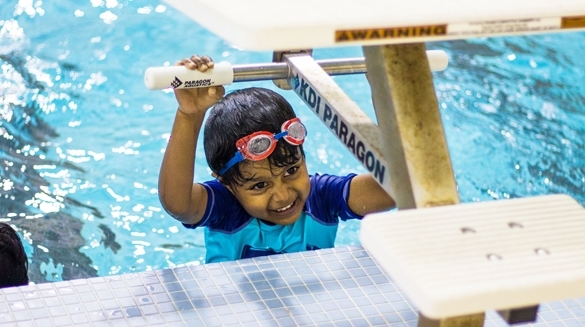 Swimming for Safety Program - This includes our Parent Child classes (both 1 & 2 ages 6 months to 4 years) as well as our Level 1 - 3. All these offerings are available Mon/ Wed Night or Tue/ Thu Night or Sat Mornings. Each class offering is 10 classes but time length may vary depending on level. Swimming for Fun & Competition - We currently offer Group Swim instruction (Junior Swordfish) and our Club Swim (Fighting Swordfish). Group swims meet Mon - Thur for 1 hour (7pm - 8pm) and focus on drills and technique. Great for anyone who has passed Level 3, or can swim at least 25 yards without stopping. Club Swim (Fighting Swordfish) meets Mon - Thur for 1.5 - 2 hours. This is a program is geared towards 5 grade through high school and we will be working on drill work and yardage sets. Swimming requirement is at least 100 yards without stopping. Birthday Parties Looking for a fun and exciting way to celebrate your child's birthday? Let the OC Aquatics Department help! Available during Open Swim. Hosting fee plus swimmer fees apply. Maximum of 20 guests. For more information, visit our Birthday Parties Page. $1.00 per person paid in the pool area.